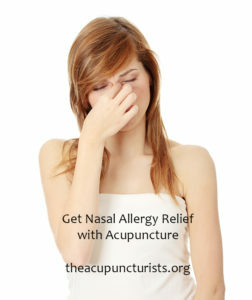 If you have been suffering with allergy or asthma you owe it to yourself to give acupuncture a try. We have been obtaining amazing results and we are fully confident that he can help you too! Call us to schedule a free consultation today. Our wellness center is centrally located between the cities of Margate, Coral Springs and Coconut Creek. Your treatments may also be covered by insurance. Allergies don’t always manifest as sneezing, coughing and itchy, watery eyes. A myriad of other symptoms can be experienced. An allergy is an abnormal reaction by a person’s immune system against a normally harmless substance. A person without allergies would have no reaction to this substance, but when a person who is allergic encounters the trigger, the body reacts by releasing chemicals which cause allergy symptoms. Allergies are generally induced by wind-born tree, grass, or weed pollen, and can cause such symptoms as: sneezing; nasal congestion; runny nose; watery, itchy, or red eyes; headaches; fatigue; and sometimes coughing and wheezing. When allergens and antibodies react in individuals with allergic rhinitis, their nasal mucosa becomes swollen and may obstruct drainage from the sinuses causing sinusitis in many people. Thus, sinus infections are a frequent complication and consequence of allergic rhinitis. IMPORTANT – If you are experiencing any of the above symptoms or conditions you should really explore allergy and sensitivity testing. The numbers are astounding! It is unbelievable how many patients that we tested and treated for food, chemical, or environmental allergy or sensitivity that are now symptom free. Once we determine what substances you are allergic to or have a sensitivity to, we can treat you with various holistic techniques including NAET allergy elimination, Bax Aura Laser Acupuncture, or traditional acupuncture. 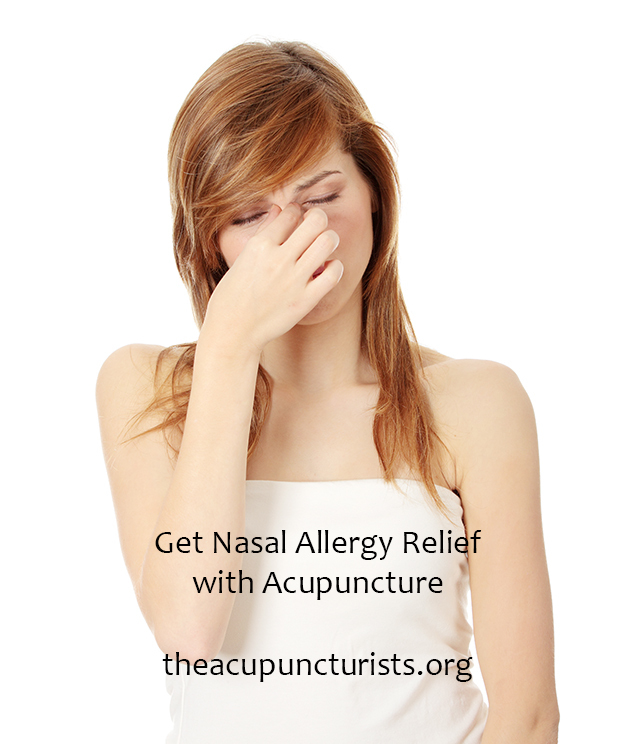 How Does Acupuncture Help Allergy Symptoms? Wouldn’t it be nice to experience the outdoors and be symptom free? Well we believe you can thanks to Chinese medicine. Acupuncture for allergy differs from treatment with Western medicine in that Western medicine tends to focus more on the symptoms, rather than diminishing the body’s reaction to allergens. 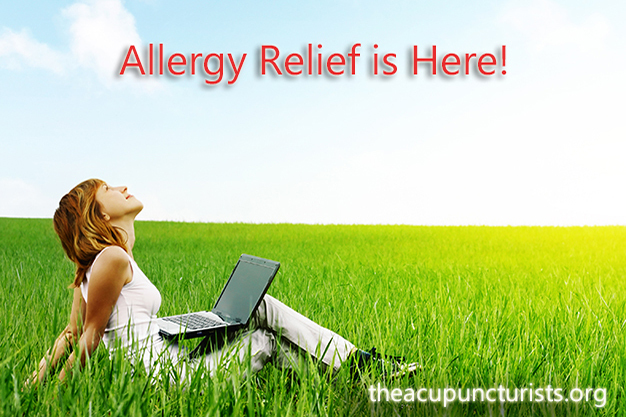 With acupuncture, symptoms are treated when they occur, but allergies are not forgotten once the symptoms dissipate. When there are no symptoms, the focus changes to strengthening the immune system so that symptoms do not recur. Diagnosis and treatment in Chinese medicine are individualized. Acupuncturists follow the patient’s pattern of suffering and differentiate the nature of the allergy as either heat or cold. Once this diagnosis has been made, specific pressure points are stimulated relative to the type of allergy in order to relieve symptoms and strengthen the body. In a study published in “Allergy” magazine, people who received acupuncture for their allergy symptoms benefited from the practice. When compared to the control group, their physical activity increased, psychological wellness improved and allergy symptoms related to the eyes and nose were less severe. Individuals involved in the study received 20-minute acupuncture treatments for six weeks. Pressure points stimulating the gallbladder, liver, large intestine and lung meridians were stimulated as well as meridians determined by personal needs, and they were given herbal supplements. The Western treatment of allergic rhinitis relies mostly on the use of antihistamine agents. Unfortunately, antihistamines only treat the manifestations of the disease and not the root. In addition, they cause side-effects such as dizziness, fatigue, insomnia, nervousness, dryness, and gastro-intestinal disturbance. Chinese medicine offers allergy sufferers a way to strengthen their bodies and significantly reduce their symptoms, without unpleasant side effects. You do not have to spend another season living with allergies. From a Chinese point of view, allergic rhinitis is due to a deficiency of the Lung and Kidney’s Defensive Qi systems, combined with retention of chronic “Wind” in the nose. This terminology may sound strange to you. It’s okay. You don’t have to know or understand how acupuncture works in order for it to work for you. Allergic rhinitis often starts in early childhood, with a constitutional weakness, but it may also start later in life, with a progressive decline of Kidney Qi. Lung and Kidney Qi Deficiency is the root of the problem, therefore, with herbal medicine and acupuncture we strengthen and nourish these organs. The manifestation of the disease is Wind invading the Lung channel in the nose. This accounts for the acute attacks. With herbs and acupuncture, we clear the Wind, reduce congestion, and open the nasal passages. It is necessary to treat both the root and the manifestation in order to produce lasting results. In Chinese medicine, asthma is called “xiao chuan, ” which means wheezing and dyspnea, respectively. Chinese medicine classifies xiao and chuan as two separate illnesses with different treatments. Xiao (wheezing) is characterized by a whistling sound during breathing, increased respiration rate, dyspnea and inability to rest in a horizontal position. Chuan (shortness of breath) is characterized by dyspnea, constant opening of mouth to grasp air, raised shoulder, flared nostrils and inability to rest in a horizontal position. Patients with xiao (wheezing) generally will have chuan (shortness of breath), while patients with chuan (shortness of breath) may or may not have xiao (wheezing). In Western medicine, wheezing and shortness of breath are both considered as symptoms which may be present in many different types of pulmonary syndromes such as asthma, acute bronchitis, chronic bronchitis and emphysema. In Oriental Medicine, there are many factors that may trigger an asthma attack. Examples include the invasion of the external pathogenic factors, diet, emotional disturbances, congenital weakness and chronic illnesses. External pathogenic factors, such as cold or heat, commonly induce asthma attacks. Lung dominates the Qi and manifests on the skin. As the environment affects the skin, the change is reflected in the Lung. As the Lung is attacked, its function to regulate water passage becomes impaired, water begins to stagnate and phlegm starts to form. Asthma attacks due to the invasion of external pathogenic factors is most likely to occur when the temperature is cold or if there is a rapid change in weather. External pathogenic factors may also include pollen, cigarette smoke, and any other allergens. Diet can also trigger an asthma attack. Raw and cold food may injure the Spleen and tend to contribute to the stagnation of fluid circulation and the increase in the production of phlegm. Heavy, sweet, and greasy food tend to create phlegm and heat in the body. Fish, crabs, shellfish and other seafood have also been noted to increase the likelihood of asthma attacks as well. Congenital weakness and chronic illness are also common causes of asthma. Children with asthma generally have congenital Kidney Qi deficiency. On the other hand, chronic illness, such as patients with chronic cough and recurrent cold/flu, are likely to have Lung deficiency. 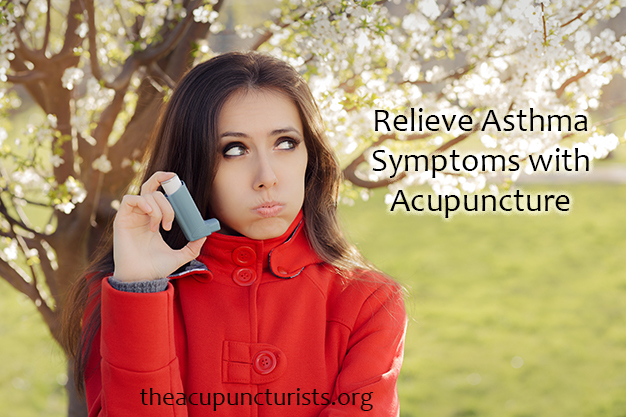 Whatever the pattern may be, acupuncture can help relieve the symptoms associated with asthma. 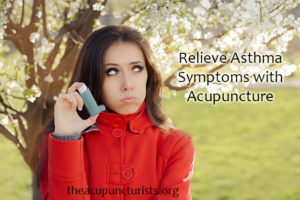 In fact, studies show that acupuncture, Chinese medicine and nutritional and lifestyle modifications can significantly reduce symptoms while reducing and at times eliminating one’s reliance on asthma medications. ASTHMA TREATMENT FOR CHILDREN – There are many acupuncture points and herbal formulas which are useful in the treatment of childhood asthma. Depending on the age and health of the child, acupressure or Chinese pediatric massage may be substituted for acupuncture. NAET Treatments and BAX Aura Laser Acupuncture is also a safe, gentle, and effective option for your child with asthma. Learn how Chinese herbs work for Allergic Asthma. Call us free a free consultation today!